Aquascape Filter Media Aquascape UltraKlean BioBalls are designed specifically to trap dirt and debris when used in conjunction with Aquascape UltraKlean Pressure Filters. High surface area matting encourages bacterial growth for biological filtration. 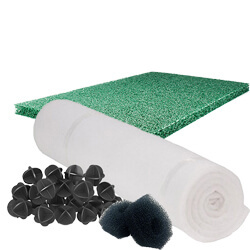 Replacement UltraFalls Filter Mat - 17.5" x 20"
Original replacement part for use with #99297. BioBalls™ provide a textured surface area (19 square inches per BioBall™) for beneficial bacteria to colonize and grow. Aquascape BioBalls™ are the ideal filtration media for use in all biological filtration. AquaScape Old Style Microfalls is rectangle/square in shape with black lid. Dimensions: 14" x 10" x 2"